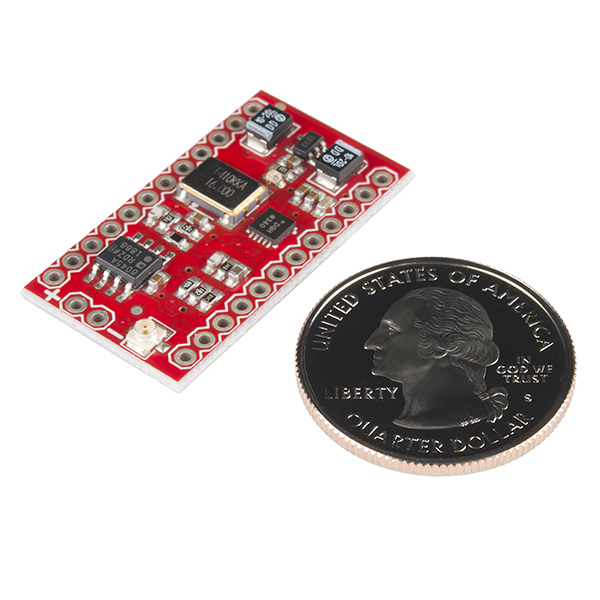 This is the SparkFun MiniGen Signal Generator, a small shield for the Arduino Pro Mini that is capable of generating sine, square, or triangle waves at up to 3MHz, and approximately 1Vp-p. Though the MiniGen is technically a shield it can, in fact, operate as a stand-alone board capable of the the same functionality as it would if it were placed on top of a Pro Mini. The MiniGen offers two out put sources for you to utilize: a 2-pin 0.1" spaced header and a u.FL connector. The output is at a DC offset of Vcc/2, however neither the offset nor the amplitude can be varied. By default, the MiniGen ships configured with a 3.3V regulator enabled and should only be used with 3.3V signals (or 3.3V Pro Minis if you are using this as a shield) unless the jumper on the back is soldered over to bypass the regulator for 5V use. Example tutorial using Analog Device's ADALM1000 with the MiniGen => https://ez.analog.com/community/university-program/blog/2015/09/21/adalm1000-interfaced-to-a-dds-programmable-waveform-generator. I used an Arduino Uno R3 to drive this (not the pro-mini as in the docs). Basically, put a blob of solder over the 5V-3.3V jumpers on the board (to be able to run it at 5V), then (Fsync,SCA,SCLK) on the MiniGen to (10,11,13) on the Arduino (and +5V/GND to power the board), and the library and stock example worked on the first try. I initially hooked the two outputs of the MiniGen to an oscilloscope and the frequency, as set in the library was dead-on. A 1V p-p sine wave, at the proper frequency riding on a DC offset of about 4 volts. I wish there was a library call for muting the output, but oh well. The board is awesome. Can't believe it'll go up to 3MHz or so. So... Why, if the AD8937 will work to 8 MHz (per the data sheet), does the board limit to 3 MHz? Haven't yet received mine, but I'm guessing C4 is all than limits the bandwidth... or am I reading the data sheet wrong? 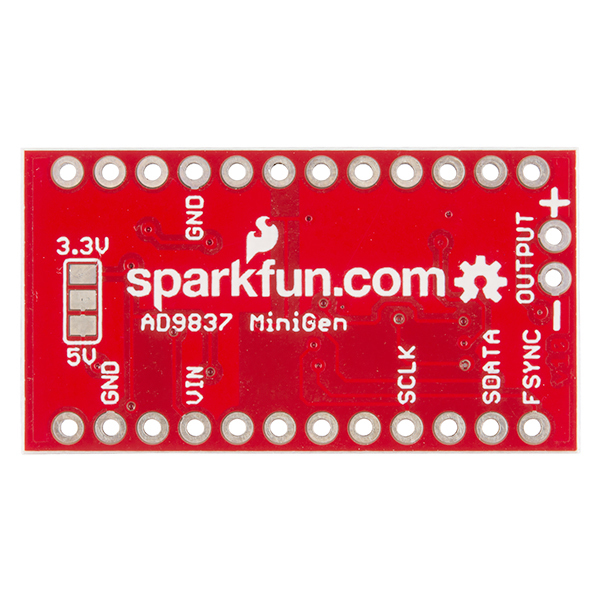 Can you make a version of this as a shield for a regular Arduino? that would be amazing! What is the point of the opamp at the output? Also, zimboy, Analog Devices' demo board for this DDS IC has the same exact issue. Word of warning to anyone planning to use this without the recommended Pro mini. I hooked it up to a Uno using 6 inch connection leads to a prototype board, and could not get it to work. Eventually I traced the problem to significant overshoot on the rising and falling edges of the SCLK, SDATA and FSYNC pins. After adding some 220pF caps to ground to filter out the high frequency components on the SPI pins, the overshoot was removed and everything started working as expected. I'd suggest adding some inline resistance as well, rather than just a capacitor. Increasing the capacitive load the driver needs to push can actually increase ringing issues rather than fixing them. Can I hook headphones up to this, or would the DC offset kill the drivers? It'd be easy enough to exclude the offset with a couple of blocking caps. It has potential. It looks like you could beat AM radio direct to audio. It might be worth it just to try that. You can load two frequencies and two phases and switch between for modulation, giving lots of Secret Squirrel possibilities. For me at least, a ramp (sawtooth) is a lot more useful than a triangle and AD could have easily made that happen. On the other hand, it is cap coupled with 10K to ground before the op-amp, so very low freq might be a challenge. The device doesn't block any harmonics so external filtering is a must. I guess that is an active filter and I would figure it out if the op-amp circuit wasn't drawn so goofy. Great op-amp by the way. Help me Jeebus I hate Eagle. The following isn't a sentence because the word "thought" at its beginning out to be "though". I think. ==Thought the MinioGen is technically a shield it can, in fact, operate as a stand-alone board capable of the the same functionality as it would if it were placed on top of a Pro Mini.== The same sentence includes the word "MinioGen" where I think you want "MiniGen" == I've course, I could be a turkey and wrong in both places but I think I've been reading fairly well today. Thank you for existing!!! The following isnât a sentence because the words âI'veâ at its beginning out to be âOfâ. I think. == "Iâve course, I could be a turkey and wrong in both places but I think Iâve been reading fairly well today." I wonder how accurately does it track down in the hundreds of Hz range. Could it be used as a musical synthesizer? it has a 3rd order reconstruction filter and a 10-bit DAC. This means low fidelity in conventional audio terms. Also the triangle wave and square wave are not band limited so they will contain strong aliasing components. Data sheet says 0.06Hz resolution. Absolute frequency accuracy would depend on the xtal oscillator. It's pretty sharp. The step size is sub-Hz, but I can't totally vouch for its accuracy because all I have to go on is my elderly Tek scope, which tells me it's at the frequency I thought it was--100Hz out to two decimal places. I used an Arduino Uno R3 to drive this (not the pro-mini as in the docs). Basically, put a blob of solder over the 5V-3.3V jumpers on the board (to be able to run it at 5V), then (Fsync,SCA,SCLK) on the MiniGen to (10,11,13) on the Arduino (and +5V/GND to power the board), and the library worked like a champ. I initially hooked the two outputs of the MiniGen to an oscilloscope and the frequency, as set in the software was dead-on. A 1V p-p sine wave riding on a DC offset of about 4 volts. It performs exactly as advertised and is surprisingly stable. A tad pricey compared to similar boards from China, but hey, you can actually get documentation, code examples and a C++ library for this one. Amazing! 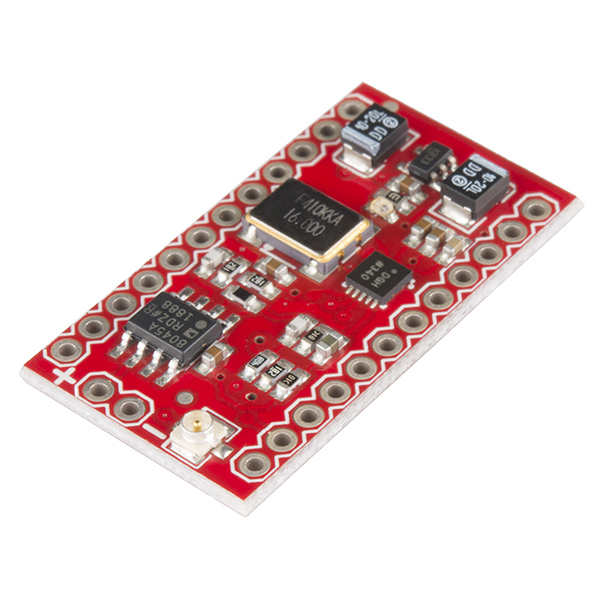 Easily mates to breadboards, shields and most microcontrollers. 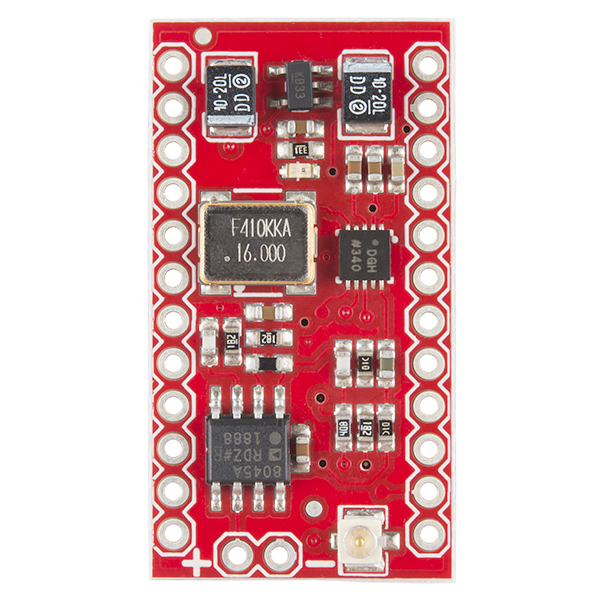 Very low power requirements and all on a quality PCB. I'm using this as a component in a ham radio construction project - cheaper and much easier than a complete scratch-build. I Like Analog Devices products and this is a great implementation of the AD9837/AD8045. Just what I needed!